Robert Gould Shaw Monument on the grounds of the Augustus Saint-Gaudens National Historic Site in Cornish, N.H. This more recent casting of the memorial (1971?) includes some later tinkering by Saint-Gaudens after 1897 and includes the sabre held by Shaw, which is broken off from the memorial on the Common. 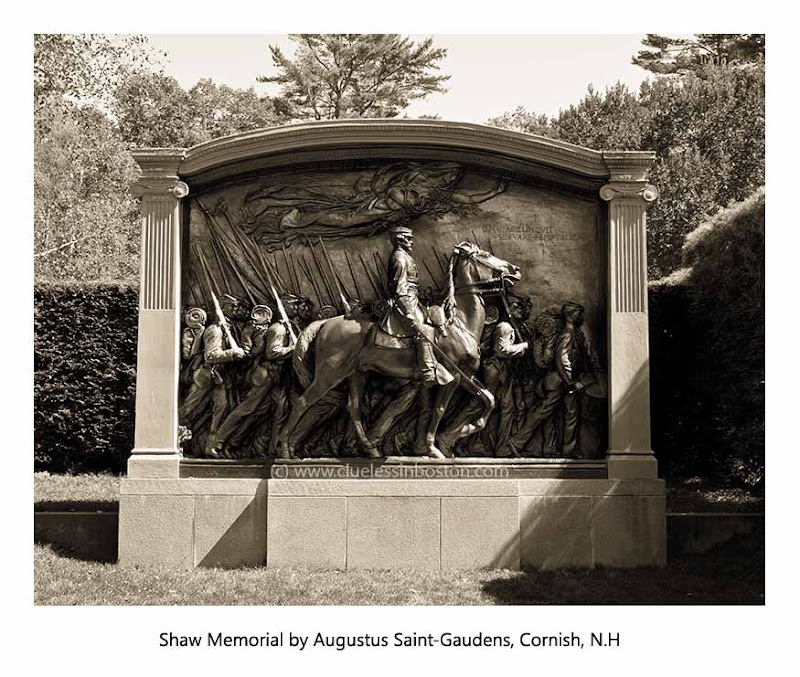 A famous composition by Charles Ives, "Col. Shaw and his Colored Regiment," the opening movement of Three Places in New England, is based both on this monument and the regiment. From the National Gallery of Art: "Commissioned in the early 1880s and dedicated as a monument in 1897 on the Boston Common, the Shaw Memorial has been acclaimed as the greatest American sculpture of the nineteenth century. The relief masterfully depicts Colonel Shaw and the first African-American infantry unit from the North to fight for the Union during the Civil War. It commemorates the young Colonel Robert Gould Shaw and the regiment of African-American volunteers who died in great numbers with him in a heroic assault on Fort Wagner, South Carolina, in 1863. Saint-Gaudens' gifts for portraiture, cadenced composition, and reserved expression calling forth projected emotions make this an exceptionally powerful war memorial." I remember a movie about that regiment, "Glory", with Denzel Washington and Matthew Broderick.A very moving story. And this memorial is a beautyful tribute to those men. Well...I will search for the movie, I'm curious! Very beautiful memorial and so interesting post! Thank you. Great post and really beautiful image. It really is a magnificent sculpture, very interesting post. Superb, Clueless. I have the Ives recording but haven't listened to it in ages. Time to pop it into the CD player again. Have you read the David McCullough book, The Greater Journey, about notable Americans journeying to Paris in the 19th century to perfect their crafts? Saint-Gaudens is featured prominently. I don't think I've ever been to Cornish NH. Gotta check this out. I've seen the piece in the NGA, it's dramatic and moving.